I came across this lovely flower on a grassy promontory on the eastern side of a beach (Playa de Esteiro) in Galicia, NW Spain. 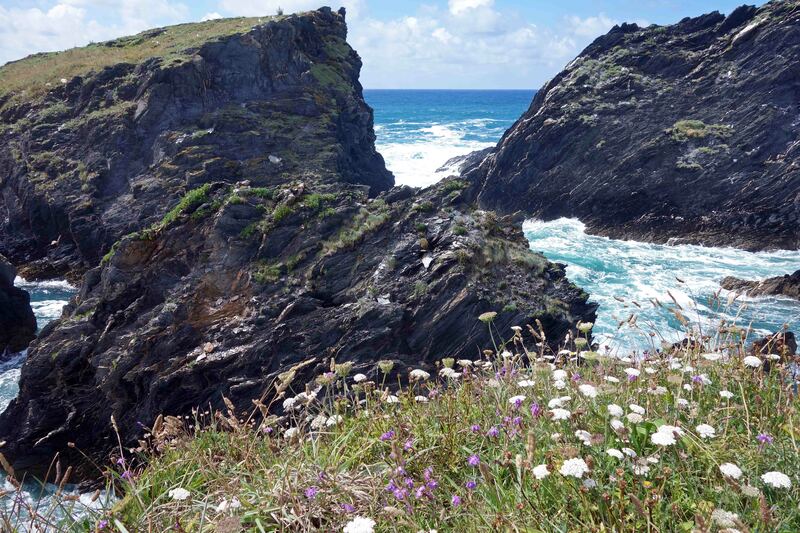 It is a site above some cliffs, with lots of wild flowers. I had not come across this plant before, which was flowering in early July. 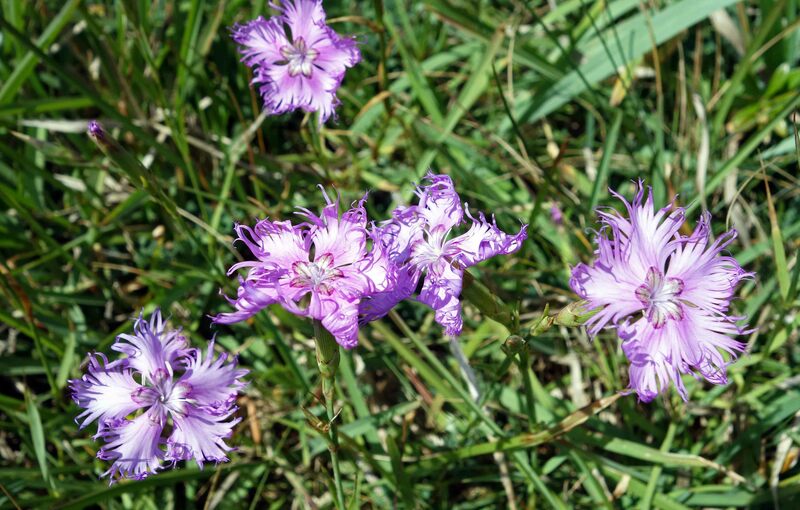 It took me a little while to work out that it was a Dianthus (‘pink’) species called Dianthus monspessulanus. At least I am fairly sure that it is this species, which seems to come in a variety of different forms and shades of pink. It is a flower which occurs widely in Europe, across northern Spain, into southern France, Austria, Switzerland, northern Italy (and beyond). 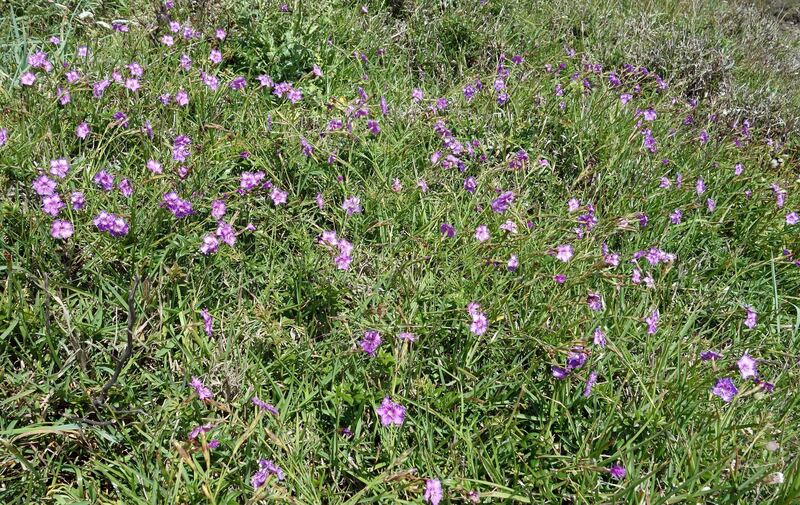 It is commonly found in grassy habitats, from sea level up to high altitudes (0-2,200m). 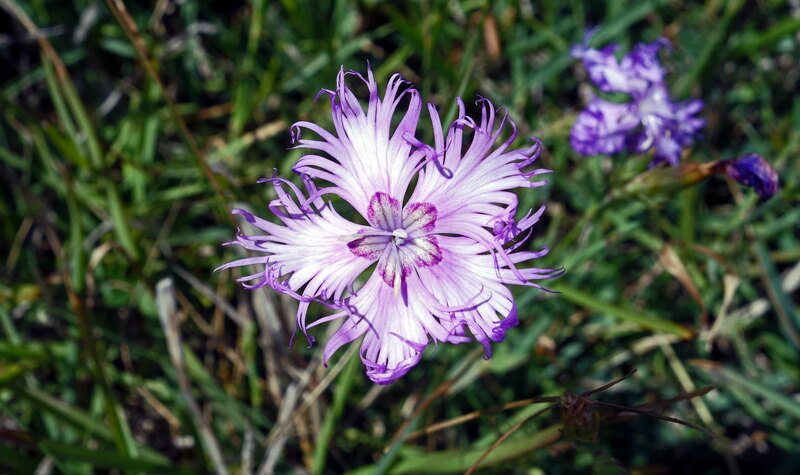 The Fringed Pink, to give it its common name, typically occurs in calcareous sites in mountains, such as the Alps and the Pyrenees. There are a bewildering number of synonyms (different names for the same plant) and subspecies, which I do not pretend to understand. Floral taxonomy seems to me to be almost designed to be totally confusing! I guess somebody understands it all! The Internet is awash with different taxonomic websites cataloguing all these different names, but very few have any descriptions or photographs. Bring back Linnaeus! He was the first person to name this plant (Dianthus monspessulanus L.) after all; so let’s just call it the Fringed Pink. One interesting fact about Dianthus flowers is that they are polyploidal; meaning that they have more than two paired sets of chromosomes. For example, it appears that the cells within this particular species (D. monspessulanus) can contain up to six separate sets of chromosomes, although subspecies with only one set – like us humans – are also known; other populations have four or six sets (1). What does all this variation in chromosome number mean? It probably has something to do with the evolutionary history of these plants, which have undergone rapid changes and ‘radiations’ (i.e. rapid evolutionary diversification into different species) during the Pleistocene glaciations – the recent ice ages (2). 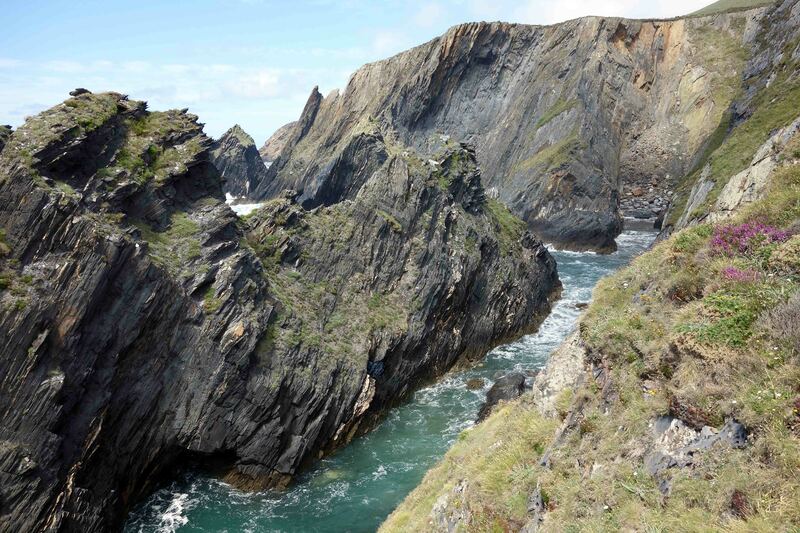 Being able to double, triple or quadruple up their numbers of chromosomes may have helped them to take advantage of the rapidly changing conditions, e.g. when the glaciers retreated and they could spread out from refuges (refugia) where they survived the long ages of cold. Individuals with different numbers of chromosomes could perhaps hybridise with each other and thus create more genetic variation, which would enable them produce a range of different plant types, capable of surviving in different environments as the conditions changed. In any case, being able to multiply up the number of your chromosomes is, it appears, a distinct advantage, and may explain why gardeners have been able to produce such an amazing range of Dianthus varieties. 1) Weiss, Hanna, Dobeš, Christoph, Schneeweiss, Gerald M. & Greimler, Josef (2002). Occurrence of tetraploid and hexaploid cytotypes between and within populations in Dianthus sect. Plumaria (Caryophyllaceae). New Phytologist 156(1), 85-94. 2) Ryan Folk. Polyploidy and Evolutionary Radiation in Carnations. See reference therein. 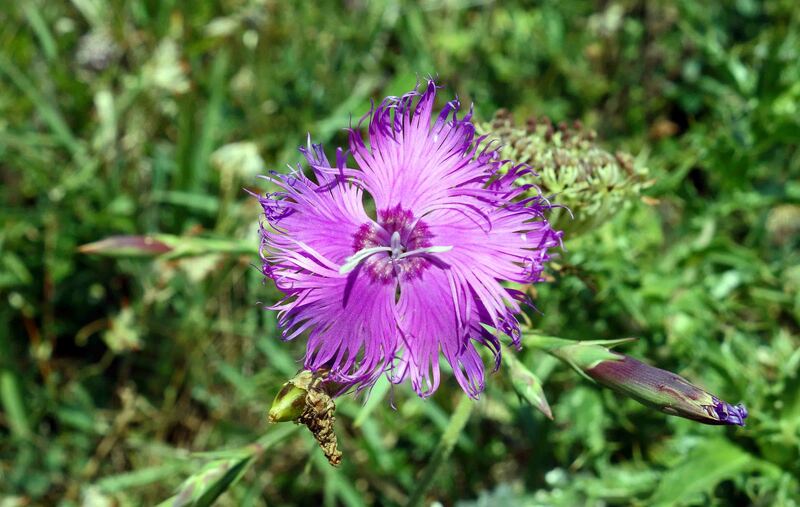 I agree with your identification – even though this flower is named after Montpellier, capital of my department here in France, I see it rarely and it’s always a thrill, such a striking flower. Polyploidy is a fascinating subject – do you know Stephen Jay Gould’s essay ‘The Ant and the Plant’ (in Bully for Brontosaurus)? It seems to me to bear out his often repeated assertion that one searches sometimes in vain for the evolutionary advantage – organisms have just evolved like that. Flies (Diptera) have few chromosomes, birds have many. The fern Ophioglossum has ‘about 630 pairs of chromosomes’, according to Gould. You stimulate me to do a post on the various Dianthus species I’ve seen and investigate this polyploidy thing a bit more. Thank you. I will look at Stephen Jay Gould’s essay (must have read it a long time ago as I have the book! ).